A perennial herb, Satureja montana is commonly called Winter savoury. 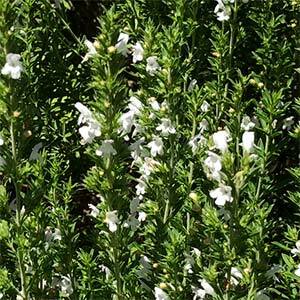 Green foliage and white to lilac pink flowers in spring to summer, this is a bushy low growing plant. This a tough plant that will grow well in poorer soils, it can be used as a herb where its leaves give a strong savoury flavour. If you look through middle easter cookbooks you will see the term Za’atar used, and this is spice mix that sometimes includes winter savoury along with sumac, sesame seeds, thyme and oregano and a range of other herbs. It is usually used in breads, sauces as well as with meats. The flavour is best described as very spicy with a little sweetness. The plant is fairly erect in growth habit sending up spikes of foliage. S. montana ssp. citriodora is lemon scented variety, rarely available. This is an easy plant to grow in a sunny warm position with a well drained soil. You do not need to amend or enrich the soil unless it is particularly depleted. A little mulch around the plant to retain some moisture in summer is beneficial. Flowers – White to pink.